Are Du a Germany fangirl/boy oder lover? Is Germany your Favorit character? Which partner do Du think Ludwig likes more? Requisiten for answering and a fan! What would Du do if Du met Germany in real life? What do Du like best in Germany's personallity? a comment was made to the poll: Which partner do Du think Ludwig likes more? a comment was made to the poll: Is Germany your Favorit character? 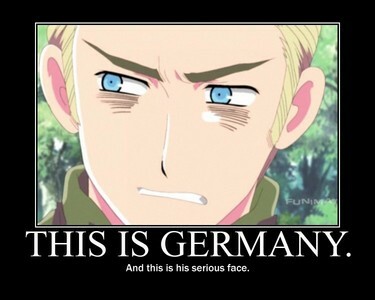 When germany is Lesen and Italy keeps bugging him what does he threaten to do?